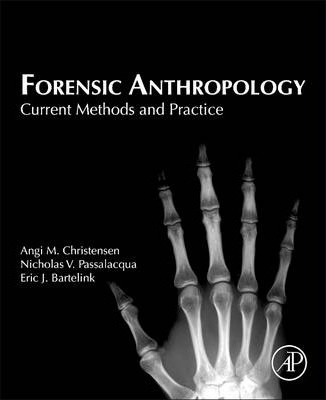 Forensic Anthropology: Current Methods and Practice-winner of a 2015 Textbook Excellence Award (Texty) from The Text and Academic Authors Association-approaches forensic anthropology through an innovative style using current practices and real case studies drawn from the varied experiences, backgrounds, and practices of working forensic anthropologists. This text guides the reader through all aspects of human remains recovery and forensic anthropological analysis, presenting principles at a level that is appropriate for those new to the field, while at the same time incorporating evolutionary, biomechanical, and other theoretical foundations for the features and phenomena encountered in forensic anthropological casework. Angi M. Christensen, PhD, D-ABFAAngi M. Christensen is a Forensic Anthropologist with the Federal Bureau of Investigation (FBI) Laboratory in Quantico, Virginia. Her primary responsibilities include conducting forensic anthropological casework and providing training for FBI agents and other law enforcement personnel, and she facilitated the development of the FBI's Forensic Anthropology Program. She is also an Adjunct Professor in the Forensic Science Program at George Mason University.Angi received her BA in Anthropology at the University of Washington in Seattle, WA (1997), and her MA and PhD in Anthropology at the University of Tennessee in Knoxville, TN (2000 and 2003). Her research interests include methods of personal identification, trauma analysis, elemental analysis, and underwater taphonomy. She has published articles in the Journal of Forensic Sciences, the American Journal of Physical Anthropology, Forensic Science International, the Journal of Anatomy, and Forensic Science Communications.Angi is a board certified Diplomate of the American Board of Forensic Anthropology, a Fellow in the Physical Anthropology Section of the American Academy of Forensic Sciences, and currently serves as the Vice-Chair of the Scientific Working Group for Forensic Anthropology. Dr. Passalacqua is an Assistant Professor and the Forensic Anthropology Program Coordinator at Western Carolina University. Prior to arriving at WCU Dr. Passalacqua worked as a deploying forensic anthropologist with the Defense POW/MIA Accounting Agency - Laboratory. Nicholas received his Ph.D. in Anthropology from Michigan State in 2012; and was certified by the American Board of Forensic Anthropology in 2016. Dr. Passalacqua is a co-founder and editor of the journal Forensic Anthropology. His research interests include age at death estimation, skeletal trauma analysis, and ethics. Dr. Passalacqua is a co-author of the award-winning textbook: Forensic Anthropology: Current Methods and Practice, and has numerous publications in such journals as: The Journal of Forensic Sciences, The International Journal of Osteoarchaeology, and The American Journal of Physical Anthropology, as well as chapters in such books as: Skeletal trauma analysis: Case studies in context, The analysis of burned human remains, Age estimation of the human skeleton, and A companion to forensic anthropology. Eric J. Bartelink is an Associate Professor in the Department of Anthropology and Director of the Human Identification Laboratory at California State University, Chico. He received his B.S. in Anthropology at Central Michigan University (1995), his M.A. in Anthropology at California State University, Chico (2001), and his Ph.D. in Anthropology at Texas A&M University (2006). He became the 89th Diplomate of the American Board of Forensic Anthropology in 2012. Eric's interests are in forensic anthropology and bioarchaeology, and he has conducted research focused on skeletal trauma, taphonomy, paleopathology, and stable isotope analysis. He has conducted an extensive research program focused on central California bioarchaeology, and also conducted work in American Samoa. In 2000, he assisted with the excavation of mass graves in Bosnia-Herzegovina through the United Nations International Criminal Tribunal for the Former Yugoslavia, and also assisted in the identification of victims from the World Trade Center 9/11 disaster in 2002 and 2003. He has published articles in Journal of Forensic Sciences, American Journal of Physical Anthropology, Journal of Archaeological Sciences, International Journal of Osteoarchaeology, Journal of Archaeological Method and Theory, Archaeometry, and California Archaeology.Eric teaches courses in introductory physical anthropology, human osteology, forensic anthropology, bioarchaeology, forensic science, and statistics. He is Fellow of the American Academy of Forensic Sciences, and a member of the American Association of Physical Anthropologists, Society of American Archaeology, Paleopathology Association, and the Society for California Archaeology. He is current board member of the Scientific Working Group for Forensic Anthropology and the American Board of Forensic Anthropology.